Meet Cardboard Man, his friends Rag Doll and Skiptrace, and the enormous tree Giganteum who guides them in their adventures. Cardboard Man is given the task of defeating the Glete, an evil being seeking to gain power in the world. In order to succeed, Cardboard Man must rely on the wisdom of Giganteum, the help of forest allies, and the support of his friends. Most of all, Cardboard Man, like all true heroes, must learn to trust himself. Before his life changes forever, Cardboard Man works at a diner holding the daily menu, until the day he catches fire and gets tossed into the trash by his mean boss. 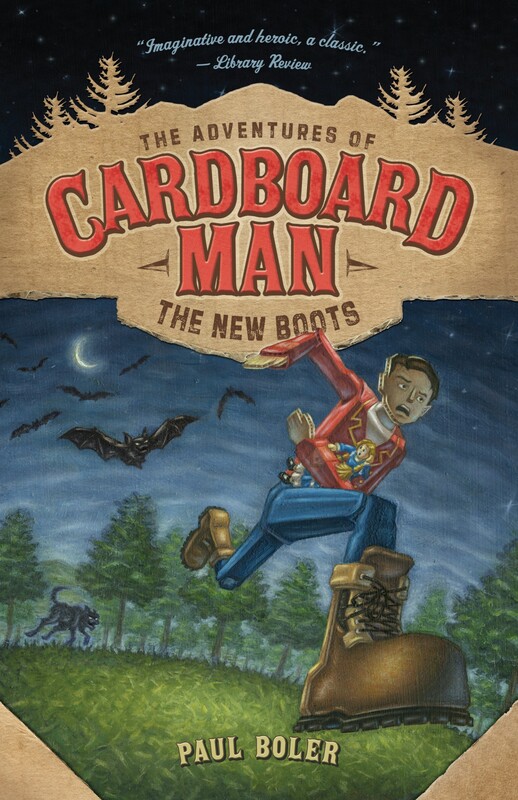 Rescued by neighborhood kids and a shoe repairman who gives him a pair of unusual boots, Cardboard Man has no idea that that the gift will launch the adventure of a lifetime! The catch is, he can only move after dark. How will Cardboard Man ever become the warrior he needs to be to stand a chance against a ruthless monster? Will he be up for the challenge or will he be reduced to pulp? And why is he, a mere piece of cardboard, chosen for this heroic task? Or…Click below to read the first chapter online.